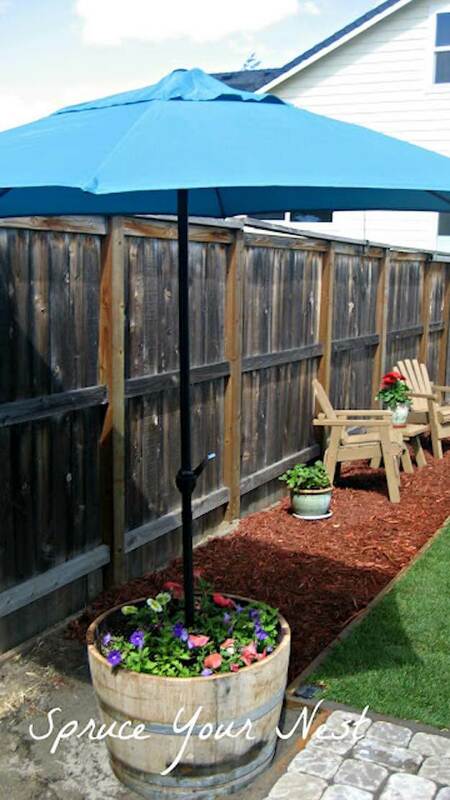 With summer in full swing, it’s time to get outside and tackle a few one day backyard project ideas. Even if you are a home improvement novice, new patio furniture, a small water feature, an attractive vertical garden, or inviting outdoor dining area can all be built in just a day. The key to any successful backyard project is planning. This is especially true if you only have one or two days over a weekend to accomplish your goals. Once you’ve decided which kind of project you’d like to do, you should also consider your budget. Even if funds are thin, you can use cheap or free materials such as tires, used terracotta pots, or wooden pallets in a variety of easy one day projects. You can also make use of tool rental and have friends and family members help you for the price of some pizza and some drinks. If you’re short on time, these one day backyard project ideas are the perfect way to spruce up your home for summer. With a little sweat and effort, the 28 wallet-friendly DIY projects below can help you make the most of the sunny days and warm nights ahead. 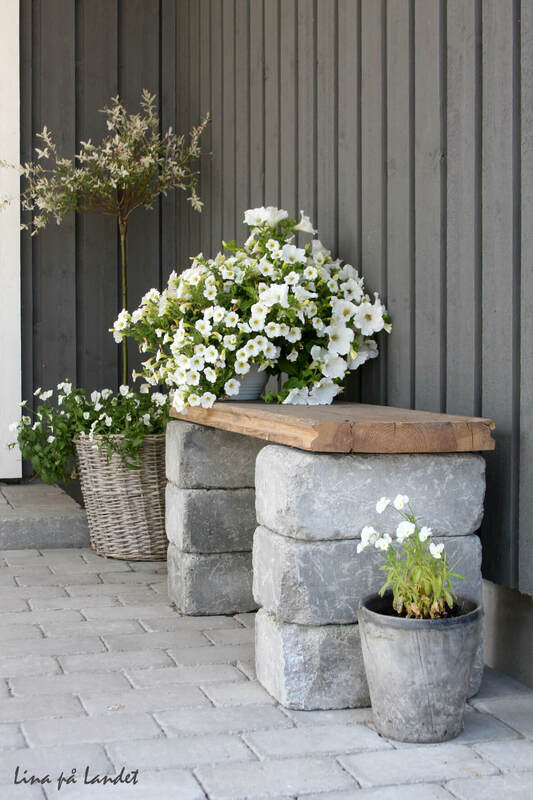 What could be simpler than a heavy, leftover wood plank propped up on two pedestals made of three Belgian blocks each to form a sturdy yet comfortable garden bench? Placing buckets and baskets of white bizzy lilies around it softens the look and makes it a bit less monumental. Belgian blocks can be carved out of granite or concrete poured in a mold and allowed to set. Don’t know what to do with those old bricks? 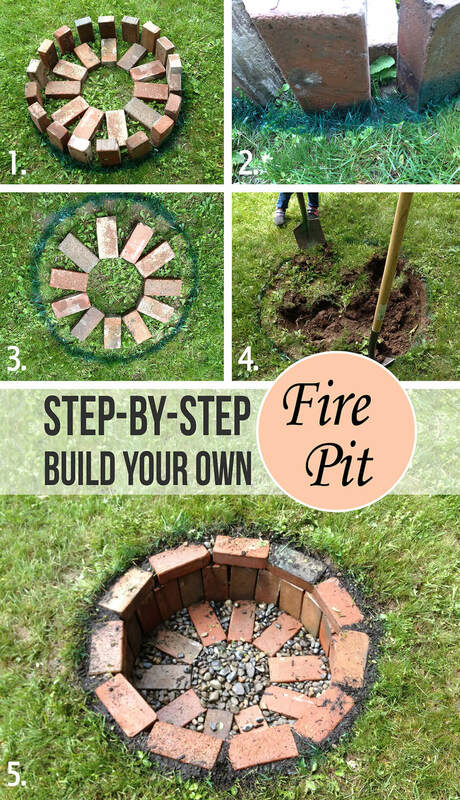 Turn them into a fire pit. Dry lay the bricks then use paint or chalk to draw a circle around the soldiers. Dig the hole within the circle and install the bricks at the bottom in a clock-like pattern, the soldiers and the brick edging on top of them. Few things are as simple to build as a trellis, so why not make more than one? 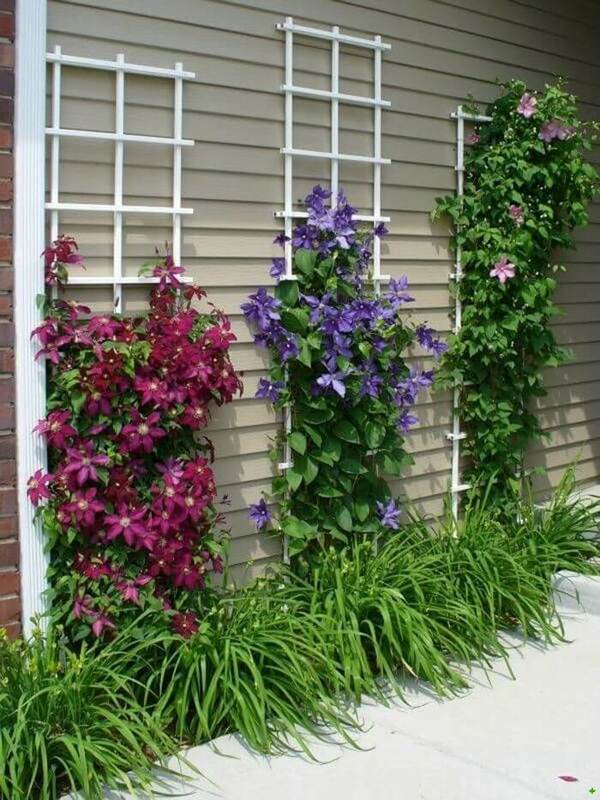 A great place for trellises is a wall of the house or garage beside a walkway, and a great flowering vine to train up the trellises is the clematis. This amazingly versatile vine has big flowers of nearly every color. People who are enjoying a swimming pool can always toss their towels on the chaise lounge, but a poolside hanging post is much more elegant. Again, the post can be made out of a long, leftover two-by-four and stabilized in a pretty ceramic pot filled with cobbles. The iron hooks and the cap are inexpensive to buy and can be installed in a jiffy. A homeowner can find an old, rustic picnic table from a salvage yard. But there’s more. 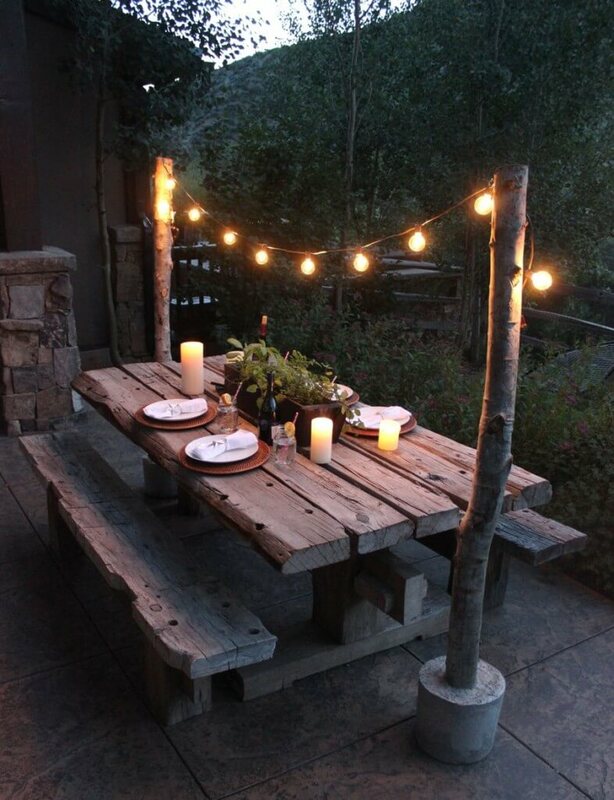 This picnic table is illuminated by Edison lightbulbs strung between two bare birch trunks. The trunks themselves are cemented into plain pots at either end of the table. Add some votive and pillar candles, and the setting becomes the ultimate in twilight dining. Don’t know what to do with those old tires and wary of taking them to the landfill? Make seats out of them. This is a project for the whole family to do on a Saturday in spring. 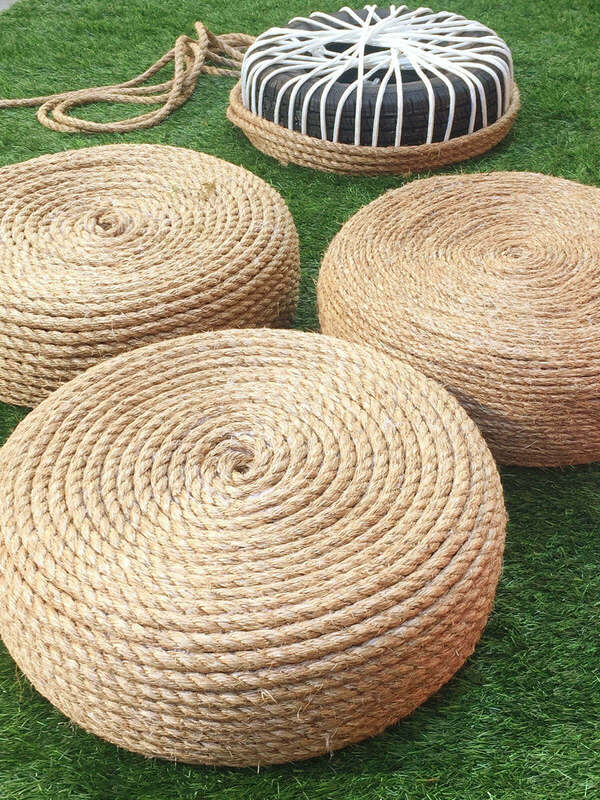 Secure the tires with plastic ties then wind yards of hemp rope around them. In the end, there will be low seats just right for the kids. 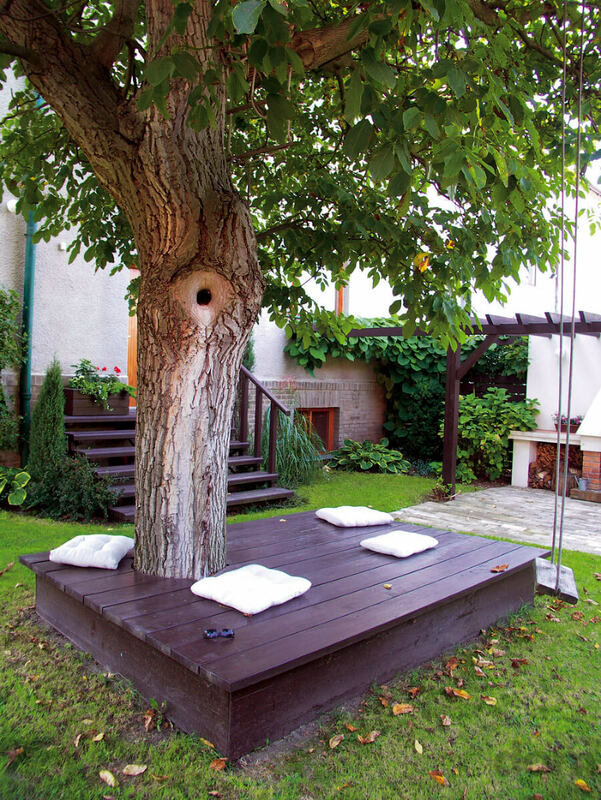 A yard that doesn’t have a pair of sturdy old trees doesn’t mean that the family has to forgo the pleasure of a hammock. 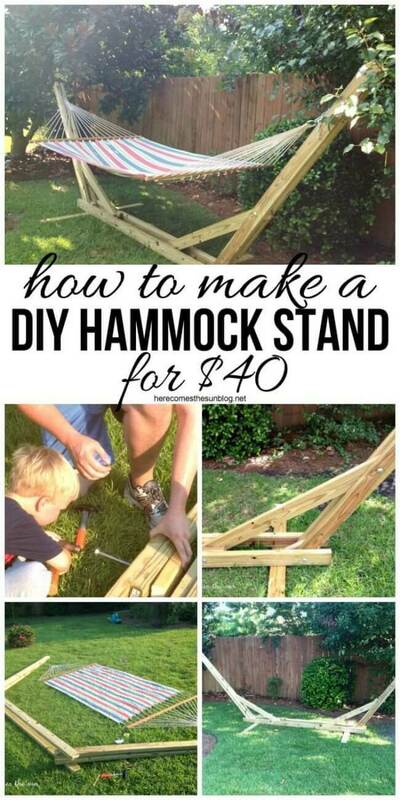 Create a hammock stand that’s just the right size for a good, store-bought hammock. Better than one placed between trees, this hammock can be moved around to take advantage of the sun or shade. Plunk an umbrella stand in a barrel of shade loving flowers for an extra pop of beauty. The flowers will not only be spared being scorched by the sun, but chairs can be placed around the umbrella to keep family members and guests from being scorched as well. Nearly every homeowner wants to attract birds to their yard. 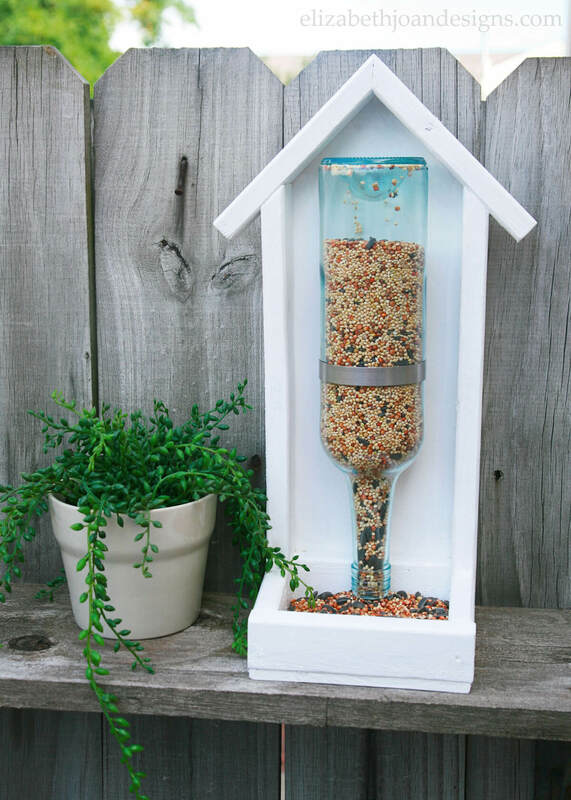 Fill an old glass wine bottle with seeds, and place it upside down in a cheerful, white painted feeder with a tray. As the tray empties, more seeds trickle down from the bottle. Make sure to secure the bottle with a metal strap. People love the sound of running water. It is soothing and brings a feeling of cool even on the hottest day. But it’s wrong to think that only rich folks can afford a fountain. 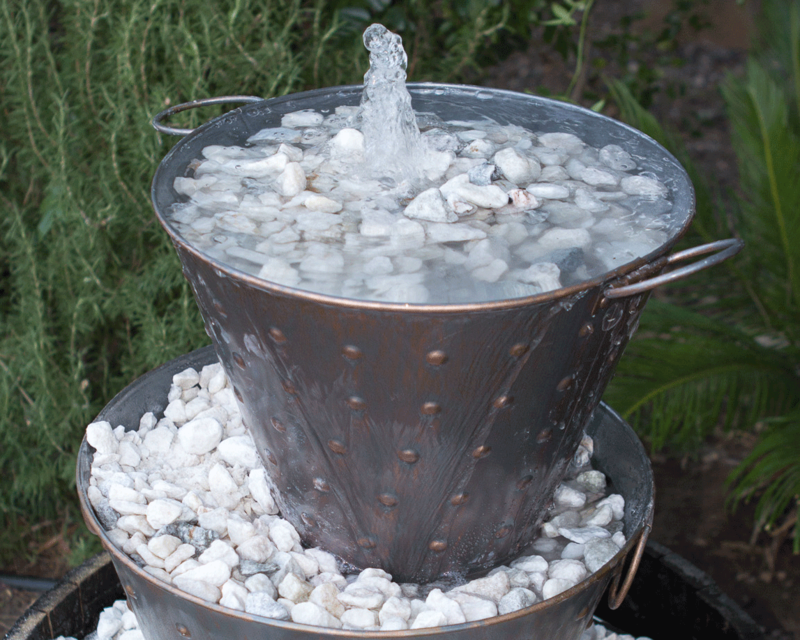 A metal bucket water feature just needs a couple of old metal buckets that aren’t being used anymore, a pump, some white gravel and access to the outside spigot. Making wooden plant stands is the solution to the problem of leftover timber. These plant stands elevate the potted plants and make them stand out, whether they’re in the garden or on the porch or patio. One tip is to put the plants in colorful pots and paint the last two inches of the plant stand legs the same color. Pergolas are amazing extensions of the house, but before the wisteria or the clematis cover it, the sun blasting own through the slats in the roof can be a problem. One solution is a sliding shade canopy. This is an easily installed system of hooks and pulleys that can pull the canopy back when the sun goes down, and pull it up when it’s directly overhead. Face it, outdoor air conditioning units are not pretty. One way to spruce it up, or frankly hide it is to build a box of wooden slats around it. The slats can be stained to make them attractive, but they should also be easy to move for the twice a year A/C maintenance and should not be so close to the unit that it interferes with its functioning. Put some pretty plants on either side of the box for more aesthetic interest. Making wooden window boxes is one of the easiest DIY one day backyard projects. The DIYer needs to make sure to put linings in the boxes before painting or staining them since the chemicals from paints, stains and preservatives can injure the plants. After that, the sky’s the limit when it comes to what to put in the window box. People have been placing seats around trees for centuries, but this is not just a seat but a platform that can seat many people and hold their plates and drinks. It can even be a place for a nice nap in the shade of a favorite old tree. Toss some pillows in indoor/outdoor fabric over the platform for extra comfort.